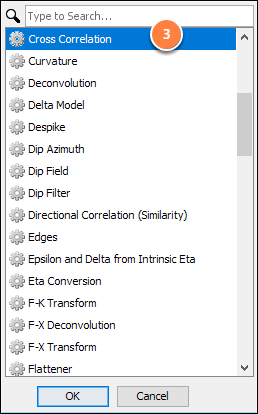 Description Cross-correlate a volume with another volume, trace, or wavelet. Cross-correlation is a statistical measure of similarity between two inputs as a function of time shifts. This process computes the cross-correlation between a volume and another volume, trace, or wavelet. Use this process to determine time shifts, repeating signals (multiple) or to quantify phase and time differences between input traces. Note: Shifts are applicable to the primary input volume. The shift value is the amount applied to the primary input trace to achieve the correlation result. Scroll down and double-click on Cross Correlation. In the Details Panel, select the input Volume. 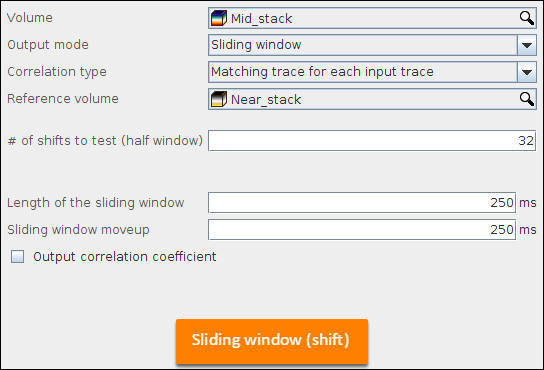 Headers: Output the trace shift that would result in the best correlation (in ms, metres, or feet) and/or the best correlation value (0-1000) in selected headers. The input sample data is left unmodified. 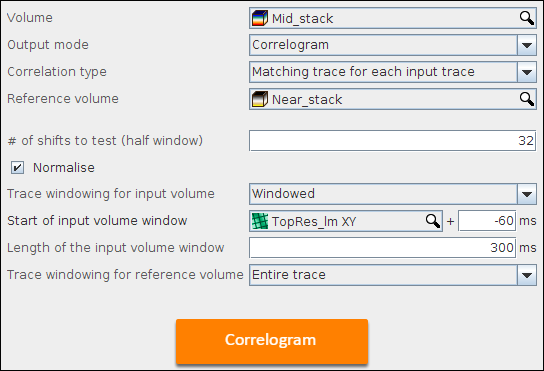 Correlogram: Output a correlogram of cross-correlations, each sample corresponding to a particular shift. Normalise: When selected, normalises the correlogram. Matching trace for each input trace: Cross-correlate each trace in the primary volume with a corresponding trace from the reference volume. 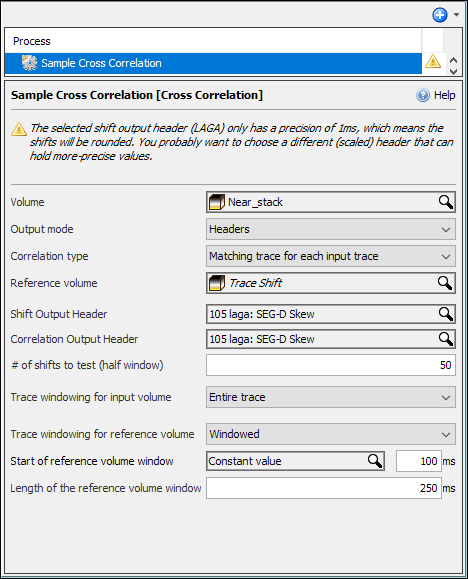 Single gather: Cross-correlate each trace in the primary volume with a corresponding trace from the reference gather. The reference volume must contain a single gather or record. Single trace per gather: Cross-correlate each gather in the primary volume with a corresponding trace from the reference volume. The reference volume must contain a single trace per gather location. 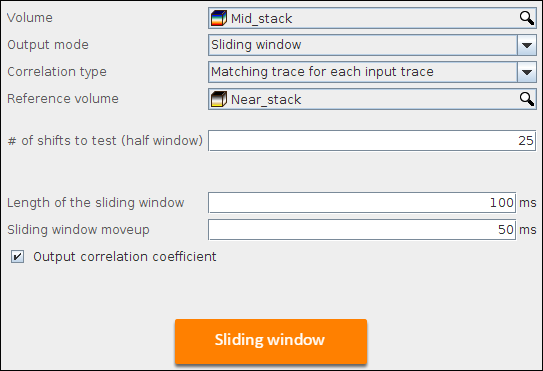 Single trace: Cross-correlate each trace in the primary volume with the trace in the reference volume. Wavelet: Cross-correlate each trace in the primary volume with the specified wavelet. Wavelets must be a single wavelet and not a multi-wavelet field. # of lags (half window): The number of relative shifts to cross-correlate. If producing a correlogram, the correlogram will be 2N + 1 samples long, where N is # of lags. I.e. N negative shifts, the zero shift, and N positive shifts. The zero shift is at time=0. Negative shifts are output at negative times and positive shifts are output at positive times. 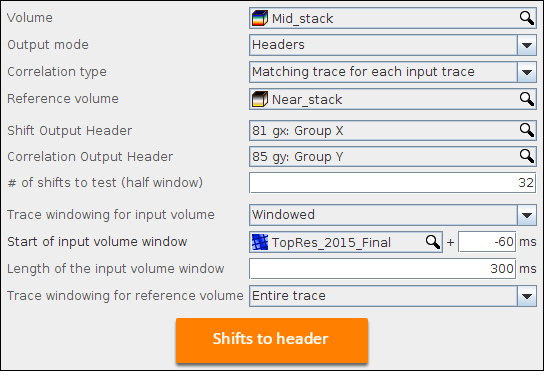 input volume: Apply a window to the input volume before correlating. 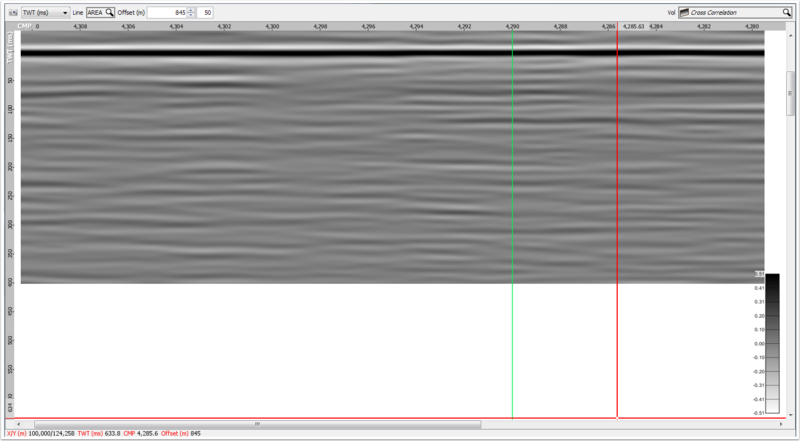 reference volume: Apply a window to the reference volume or wavelet before correlating. Start of window: The start time/distance (or horizon) of the window. Length of window: The length of the input volume window. Good cross correlation between input gather volume and trace mix volume showing strong zero phase event at 0 ms and non-coherent event below.